Kriti Sanon looked stunning in Golden Metallic Slip outfit designed by Monisha Jaising for the Conde Nast India. She looked awesome in this thigh high slit dress with a drape along its waist along with a choker necklace and hair tied neatly at the back. She gave pleasing look in Valliyan Choker along with Judith Leiber clutch in this golden outfit. Rockstar Actress Nargis Fakhri Bossy look in Blue PantSuit with a plunging neckline designed by Monisha Jaising. The Suit she wore showed almost her deep neck with golden heels. She wore this outfit during the IIFA 2016 in Madrid. Deepika Padukone looked fabulous in the mid parted straightened hair along with a white corset top and high waist Black pants with flared bottoms designed by Monisha Jaising. Deepika wore this outfit at the Esquire Middle-East Awards. She completed her looks with black pointed shoes. Kareena Kapoor looked stunning during the Koffee with Karan Johar couch while she shared the couch with her brother Ranbir kapoor. Kareen Kapoor chose to wear a Pink off shoulder draped gown design by Monisha Jaising and kept her hair swept sideways along with beautiful neck-piece resting on her bare neck. Deepika Padukone donned a custom-made high slit gown by Monisha Jaising during MTV EMAs event. She just looked stunning in this awesome outfit. Thigh high slit gown just like a wrapped skirt held with a wide black belt along with a black metallic brassiere and shimmered cape with a fashion in trend. She wore tasseled Valliyan earrings in matching color and black high heels to complete her look. Karishma Kapoor stole the show in Black and Gold gown designed by Monisha Jaising during The Vogue Beauty Awards 2016. Gown had a gold clasps near the chest and waist. Karishma Kapoor styled herself with Aurelle earrings with red lipstick and neatly tied hair to look beautiful. She also got the award of Ageless Beauty at the event. 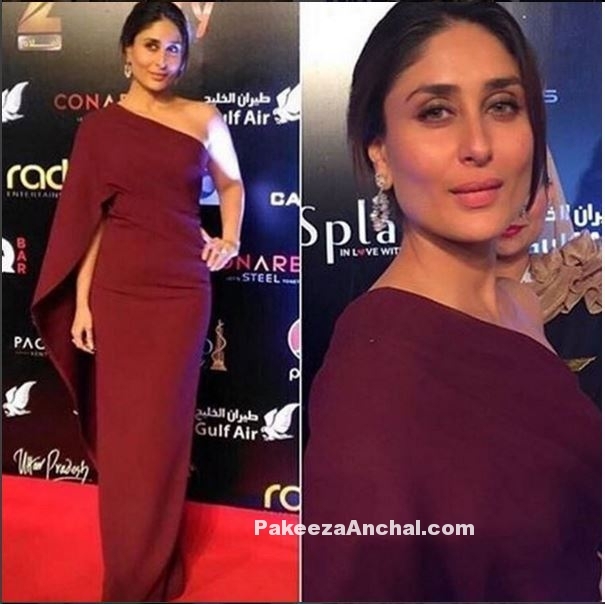 Kareena Kapoor looked stunning in this Maroon One Shoulder Marsala Gown designed by Monisha Jaising on the red carpet during the TOIFA 2016. She paired the One Shoulder dress with a Nirav modi earrings to accentuate the dress for the evening. Amy Jackson picked up a Black sleek Gown which showed off her beautiful curvaceous body in a Cut-Out gown with Gold detailing designed by Monisha Jaising. Amy Jackson looked stunning in this outfit with her hair pulled back and Jewelry by Anmol. Athiya Shetty was wearing a blue Off Shoulder strapless Gown designed by Monisha Jaising, while she arrived on the red carpet during the FilmFare Awards 2016. She kept her hair open with a side swept curly hairstyle.